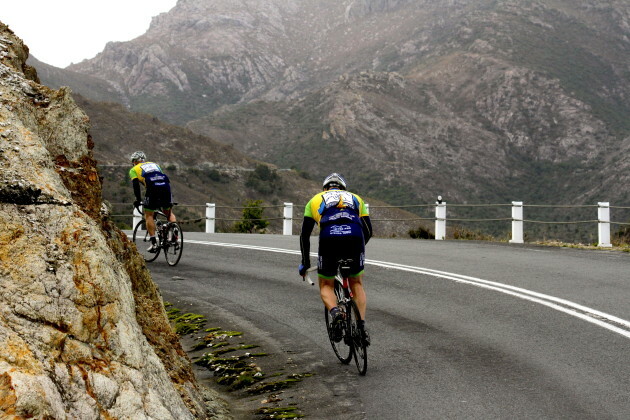 The spectacular but barren 99 Bends climb out of Queenstown. Bass Strait is calm. My blood pressure is not; and it has little to do with my first flight on a propeller-driven aircraft in 34 years. Descending into Devonport I’m energised by the opportunity to ride some of the most spectacular roads in Australia. Yet I’m also decidedly anxious as the 500km journey to Hobart – and perhaps more worryingly the 8,500m of climbing – begins to loom very large indeed. I just hope my knees hold up. They’ve let me down before. Within moments of landing my mood eases a little as the smile of our host from Tas Pro Cycling Tours, Richard Douglas, radiates across the arrivals hall. Together with his business partners, wife Kristy and Todd Clifford, he’s on a mission to ensure we have the two-wheeled time of our lives. I’ll be doing my best to oblige. Our hotel transfer takes all of 10 minutes, check-in even less and we quickly assemble our bikes with tools provided by the organisers. A mechanic is even on hand if required, always nice to know. Within the hour we’re off in search of a pub on a sleepy Saturday afternoon in Devonport. They say there are 27,000 people living here. We’ve seen about three. Except for the local drive thru bottle shop. It’s buzzing. The first day starts at a very civilised 10am. It’s the shortest stage of the entire trip. But the profile shows it’s uphill all the way. In mild and mostly clear conditions we head south from Devonport, greeted almost immediately by picture-postcard apple orchards. The early kilometres are reasonably sedate, largely spent gauging the abilities of the bunch and establishing a few important ground rules. Reassuringly, and not surprisingly given the policing backgrounds of the organisers, safety is always paramount. I’ve rarely felt more comfortable on unfamiliar roads. We roll through the wall mural town of Sheffield (think 1980s Belfast without the balaclavas and assault rifles) and the first real test arrives shortly after lunch as we hit the 6km Cethana Road climb to Moina, sometimes used as a finish in the NRS Tour of Tasmania. Grinding my way up several decidedly unpleasant sections I wonder if I should have brought compact cranks; too late now of course. Beyond Moina the road continues its upward trajectory, thankfully at a more forgiving gradient as we punch out the kilometres through sub-alpine scenery, including my first ever sighting of a Tassie devil. Alas, it was road kill. Arriving at Cradle Mountain village a few of us decide to keep going, tackling the extra 9km up to Dove Lake. 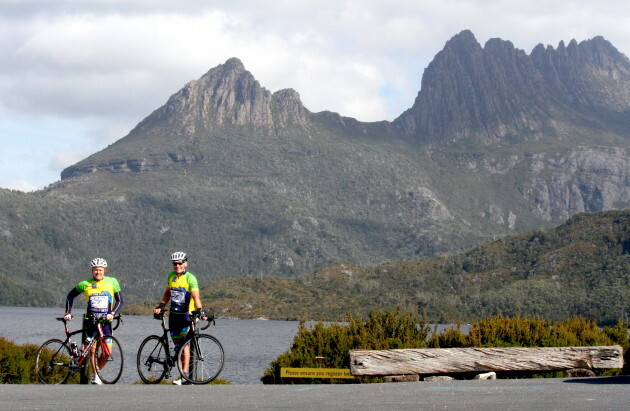 Our effort is well rewarded as the sun obediently emerges for arguably Tasmania’s most iconic photo opportunity. It’s been a buoyant first day, no doubt. But over a superb dinner of Cape Grim steak comes perhaps the most naively ambitious call of the trip. “You know, that wasn’t so hard. Maybe we should all climb Mt Wellington when we hit Hobart as well.” Yeah, right. Just before sunrise we hear it. The forecast rain begins to pepper our cabin roof ensuring an epic day as we head into the wilds of the Tasmanian west coast. Glad I packed my overshoes. The first 40km are ridden through persistent rain and fog, but mercifully it isn’t cold. Regardless, a nasty double-figure pinch in the middle of nowhere ensures the blood is well and truly pumping. 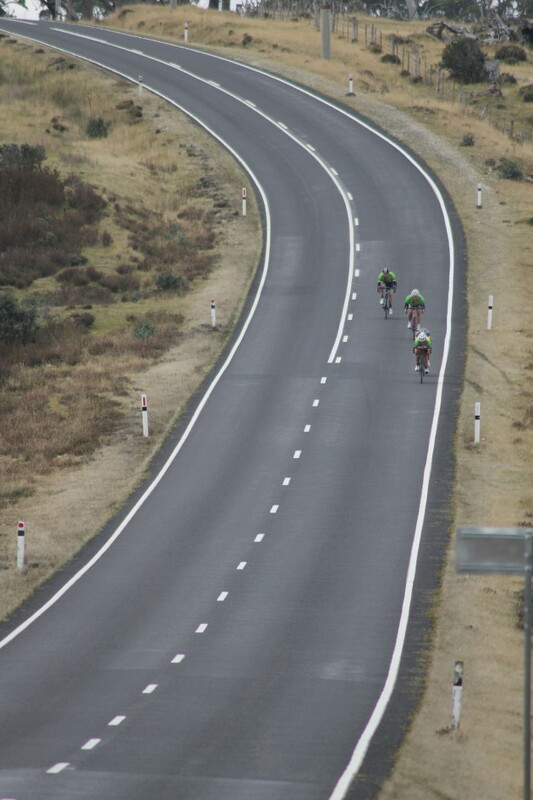 I might also just offer a word of caution: beware the Tasmanian cyclist who speaks of ‘undulating’ roads. From what I can ascertain anything shorter than 4km and under 10% is considered a mere blip in these parts. The elements fail to dampen our spirits as we follow the Murchison Highway, periodically shrouded in eerie low cloud. The lush, winding ascent of Mount Black splinters the bunch but our gravity-defying exertions are worth it as a slick descent takes us into the not-so-long-ago booming mining town of Rosebury. Around lunchtime the gloom begins to clear and the middle part of the day is surprisingly dry. The respite is only temporary however, as the rain returns with a vengeance near Zeehan. My shoes squish with every revolution of the final 20km and as we roll turns into the west-coast port of Strahan. Next stop, the Southern Ocean. Soaked to the bone after nearly six hours in the saddle we arrive at our accommodation overlooking Macquarie Harbour to find we’re already checked in with a warm room – and piping hot shower – waiting for us. Even better, our filthy riding gear is whisked away for cleaning giving us time for some impromptu sightseeing along the local waterfront before dinner. The local pub, Hamers, is showing Mork & Mindy re-runs. Huge kudos to our ride leaders today, Dean and Dale, who’ve spent the lion’s share of the 140km with their noses in the wind and rain. The rest of us just rolled to the front when we felt like it. In my case, very occasionally. We’re told this will be our most scenic day – an enticing prospect considering where we’ve been so far – as we follow the Lyell Highway deep into the Franklin-Gordon World Heritage region. With dead roads, four significant climbs and nearly 250km already in my legs I’ve been a little anxious about today, figuring if my knees are going to fail this will be it. It’s been decided today’s first short section into Queenstown will be navigated on four wheels, not two, as the roads are a little suspect for bunches with narrow shoulders and blind corners aplenty. The actual riding begins under chilly skies from Queenstown’s infamous gravel AFL field. As with the spectacularly barren ‘99 Bends’ climb that overlooks the town, grass simply won’t grow here due to decades of smelter fumes and topsoil erosion. It’s not quite Ventoux, but still reminiscent of a rocky moonscape. With the 99 Bends conquered the scenery reverts to type as we wind our way towards the banks of the salmon-rich Lake Burbury, one of the many man-made lakes and canals that serve the state’s hydro electricity network. Set against a backdrop of ruggedly beautiful mountains you could be riding alongside a loch in the Scottish Highlands. Flanked by giant ferns and pristine streams the picturesque 4km rise through Victoria Pass provides one of my most enjoyable climbs. Then it’s across the Franklin River before the grinding 12km ascent of Mt Arrowsmith, which to the great amusement of the bunch I keep mistakenly calling Mt Aerosmith. Not sure about love in an elevator, but I wouldn’t mind putting my bike on one as the long slog begins to take its toll. A quick regroup at the top is followed by a brisk run into Derwent Bridge for lunch where we enjoy the best espresso of the tour, served by an Italian backpacker no less. The final 30km has a bit of everything, highlighted by a break-neck descent that sends us hurtling towards the Tarraleah spillway crossing. However the joy of our downhill yin is closely followed by the leg-sapping yang of the 9% grind up to the Tarraleah town proper. 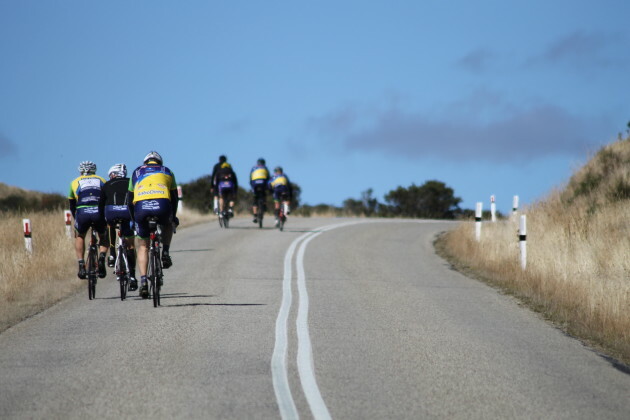 After 135km and 2,500m of climbing it’s not the easiest way to finish the day, but with the encouragement of our ride leaders we all make it to the top. Just. 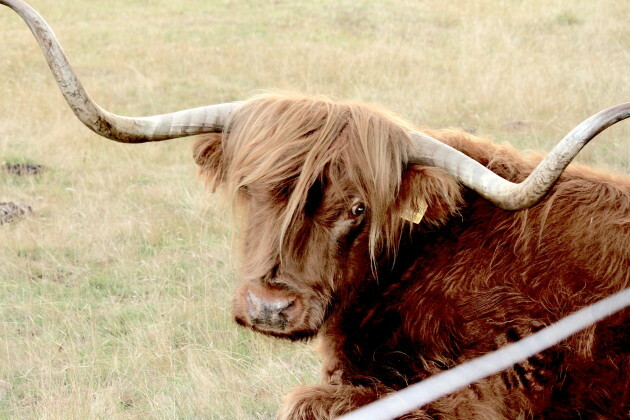 Tonight we’re staying in two immaculately-appointed Art Deco workers’ cottages overlooking the hydro power station and, continuing the Scottish theme, a field of long-haired highland cows. Reportedly they were once used as brothels by none other than Madame Lash, which is cause for teenage-like grins when you’re standing alongside a bunch of sweaty middle aged guys in skin-tight clothing. No whips, but plenty of chains. Tarraleah is of the few places we’ve had no mobile service. However they say if you perch precariously off the town’s hydro lookout you can usually get enough signal for a quick call or email. As I look down at the massive water pipes – and almost certain calamity should I slip – I conclude the kids can wait until tomorrow. Funny. The longer this ride goes, the better I’m sleeping. They say today will be fast and downhill as we follow the Derwent River into Hobart. But I’ve heard that before. In preparation I decide to go for a quick spin to test my legs. They’re toast. Day Four begins with the now-traditional ‘undulations’, thankfully offset by several exhilarating descents on wide, well-surfaced roads that see us nudge 90kph without much effort and inspire a few spontaneous sprints. There’s even a two-man breakaway just after Hamilton that we attempt to chase down heading towards lunch. Dumb idea. After 10 minutes on the rivet and little sign of the escapees the hammer man begins to pound what’s left of my sorry legs into an oozing pulp of woe. Thank goodness we’re on the home stretch. Refuelled in New Norfolk with fresh baguettes and muffins, we finally reach the outskirts of Hobart and travel the last 15km along local bike paths that take us into the heart of this history-rich city. It isn’t just boring suburbia, mind you. At one stage we even ride past a massive flock of black swans and signets on the Derwent. I mean thousands of the things. It’s a pretty amazing sight. It’s hard to describe the feeling as we arrive at Constitution Dock. There’s excitement and relief. But a wave of pride also washes over me, both for myself and the rest of the group whom I’ve suffered and laughed alongside for the past 96 hours. Back slaps and selfies are the order of the day. Then it’s off for a desperately-needed shower, beer and celebratory dinner at the Tasman Restaurant in the Grand Chancellor Hotel. Seriously, I’ve never eaten so well in my life. I started this ride filled with anxiety and knowing just one of 10 people. I’ve ended it bursting with pride alongside 10 great mates. This is why I love cycling. This is why I loved Tasmania. Chances are you will too.